WWE Survivor Series 2017 Special #1 Review – AiPT! This comic encapsulates the current WWE product: it is, at times, ridiculous, confusing, infuriating, and oddly brilliant. What happens when you take 20 years worth of some of the craziest scripted and real happenings from one of professional wrestling’s longest-running and popular pay-per-views and illustrate them? What if you throw in a dash of “what-if” and a bit of “kayfabe” mixed with actual reality? And then filter it through the lens of the world’s largest pro wrestling company? 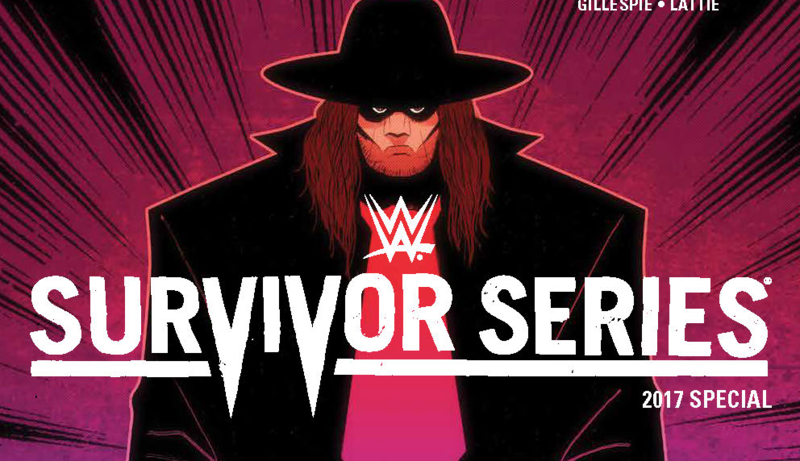 You end up with WWE Survivor Series 2017 Special, a comic so mixed in its execution that Bret Hart would be ashamed to be on the cover. Oh, wait, he is on the cover with the flag of Montreal reflected in his iconic sunglasses. Speaking of the cover, since that’s as far as most readers will get, I understand having Bret there, as well as Brock Lesnar and Goldberg squaring off. Last year’s main event was about 12-13 years late in happening, but it was quite remarkable. But, Nia Jax about to be flying cross-bodied by Naomi? Why? Why are they on the cover when there are 20 years of amazing moments to include, none of which include the two of them in any significant way. I digress. For those of you who wish to brave the pages with me, head to the next paragraph. The first story is perhaps the most infamous Survivor Series moment of all: the Montreal Screwjob. In 1997, current WWF champion Bret Hart had signed a contract with rival company WCW. Bret was unhappy with the new direction WWF was taking and was offered quite a bit of money to jump ship. While Bret was a consummate professional, WWF owner Vince McMahon was concerned that Hart might refuse to lose the WWF title and take it to Atlanta — home base of WCW — and disgrace it on air, tarnishing its reputation and prestige. Hart was scheduled to lose the title the night after his Survivor Series match with up-and-coming degenerate Shawn Michaels. Rather than the planned finish where Hart would retain in his hometown, McMahon called for the bell early while Hart was in a submission maneuver mid-match. Michaels would win the championship and Hart would spit on McMahon in public, and deck him in private. However, this isn’t the story told in the comic. The tale woven here is an odd mix of kayfabe (wrestling speak for staying true to the story) and reality where McMahon plans to screw Bret, but Michaels knows nothing about it and plans to win the match as the better wrestler, never mentioning the pre-determined nature of the sport. Hart even claims, in the comic, that he will relinquish the title on RAW the next night, but can not be beaten in his hometown. The match is well drawn, but the story focuses on Michaels thoughts after the event rather than what actually occurred. A few of the other stories, like “Debut,” which tells the story of Olympic Gold Medalist and current RAW General Manager, Kurt Angle’s first match in WWF, are fine. My quibble with “Debut” is that Angle wrestled Sean Stasiak that night, not a generic jobber of a completely different ethnic background, but that’s me being pedantic. A bigger issue might be how the comic tries to joke away Kurt’s actual problems with addiction by adding the throwaway line “I was drinking too much milk back then.” Ha. Let’s ignore the pain killer addiction that almost cost Angle his life and joke about milk. Comedy gold. Goldberg’s return to the ring, told in “1 minute 26 seconds” is pretty meh. The art style doesn’t do it for me at all. Same with the art for “The SHIELD Called Up” which is just weird. It too goes straight for the kayfabe button, treating the trio of Seth Rollins, Dean Ambrose, and Roman Reigns as if they actually invaded Survivor Series on their own without it being part of the script. Meanwhile, Cerebral Assassin Triple H stands behind a comic book villain set of monitors observing the team he would soon destroy, mwah hah hah. The only stories in the book that I think really embraced the idea of wrestling kayfabe and the ridiculousness of it all are “Down the Hatch” and “The Root of All Evil.” The former is a cartoony take on one of the dumbest things to ever happen in professional wrestling (and I realize how low that bar is), the appearance of The Gobbledy Gooker. Look, if you don’t know about the Gooker, you really should watch a clip at least once. Look, here comes one now! The most successful comic in the collection is the most kayfabe of them all and tells the origin of one of the most iconic superstars of all time, The Undertaker. I loved this comic. It takes place in my favorite wrestling hometown, Parts Unknown, shows the original Undertaker living his gimmick and being recruited by The Million-Dollar Man, Ted DiBiase and his valet, Virgil. It perfectly encapsulates the insanity of professional wrestling, especially in the early 1990s. In the end, this comic encapsulates my current feeling on the WWE product: it is, at times, ridiculous, confusing, infuriating, and oddly brilliant. I’m a big WWE guy. They’re my wrestling company of choice, despite and because of all of this. Even so, this comic is a pass for me. While BOOM! has done good work on WWE comics, this is a bit of a mess. Enjoy the PPV. Weird mix of in-character and real life. Blend is off. AVENGERS: NO SURRENDER: Second month covers revealed!